There are certain things indigenous to an area that non-natives are bewildered by but which the locals view as an every day occurrence. Kinda like if you were to visit Australia and saw a Kangaroo running across the roadâ€¦ you would probably be rather enthralled while an Antipodean would treat it as you might treat a deer. 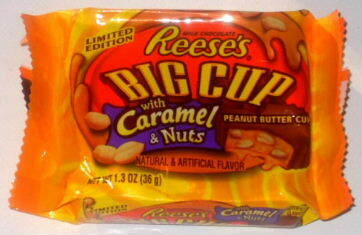 The candy equivalent of this for me is a confection known as the peanut pattie. I never knew such things existed before my move to Texas. Since moving to the Lone Star state, I see them everywhere. Gas stations. Drug Stores. Vending Machines. Itâ€™s so prevalent that itâ€™s not even limited to one distributor, as several varieties have caught my eye. 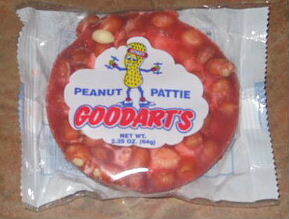 Unsure of which brand to purchase, I went with Goodartâ€™s Peanut Pattie. My logic was the following: thereâ€™s a female peanut mascot on the wrapper lifting weights. What does that have to do with good candy? Probably nothing, but I couldnâ€™t resist hilarious thoughts of Mr. Peanut trying to ask this character out if he saw her at the gym, and I bought the candy purely because of successful advertising. Theo is so environmentally-politically-correct that one of their bars has a picture of Jane Goodall with a chimp on it. 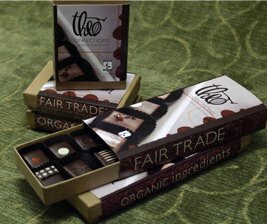 Their products are made with fair trade and organic ingredients. Thatâ€™s all very nice, but what you want to know is: How do they taste? These are a little larger than most company’s bonbons – large enough that a person like me, who usually cuts a really good, expensive filled chocolate in half to save some for later, can cut these in quarters and still enjoy them. Other good qualities of the presentation: They are all rectangular or square, further aiding the cutting-up process, and they are decorated differently and come with a flyer identifying and describing them. The fillings are all described as ganaches. Ganache is basically cream and melted chocolate whipped together, but not for so long that it turns into whipped cream. Some of these don’t have chocolate in them, but they are nearly all that kind of very soft, melty texture. No hard work chewing caramels or crunchy nuts, here. The last of the three expired limited edition pieces of candy I purchased from the Dollar Tree Store was the now defunct Reeseâ€™s Big Cup with Caramel and Nuts. Honestly, I donâ€™t remember hearing about them when they were out. Also being frank, I wasnâ€™t too thrilled to get my hands on these any more than I am with any new candy that presents itself. At least with the Hersheyâ€™s Special Dark Raspberry Flavored Macadamia Bar and 100 Grand Dark Bar they sounded appetizing. But a Reeseâ€™s Big Cup? With caramel? And with peanuts? 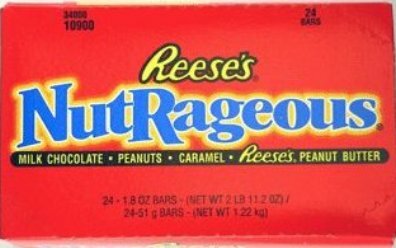 One of my favorite candy bars in the entire word is the Reese’s Nutrageous bar, a slab of choco-peanut goodness that comes wrapped in the beloved and obnoxious orange packaging of all Reese’s products. The Nutrageous bar came on the scene in 1994, when I was in 7th grade, and it was love at first bite, as far as I can remember. The Nutrageous has everything I look for in a candy bar: peanuts, caramel, and milk chocolate. As an added bonus, there’s the ingredient that really makes the Nutrageous special: whereas most peanut/caramel bars have nougat as their centers, the Nutrageous is held together by a thick, creamy layer of the famous Reese’s peanut butter. It doesn’t get much better than that. Every year, the internet spews out a million lists of overrated and underrated things. This band isn’t as good as your brother thinks it is; this movie was tremendous, even though only four people saw it; this book may be a best seller, but it’s pretty lousy; nobody appreciates the greatness of slugs, and so on and so forth. These lists can be annoying, as some people tend to hate everything that is even remotely popular, but at times the lists can also be incredibly validating: sometimes it’s nice to see a popular-yet-stupid thing get ripped to shreds, and even nicer to see an underrated gem get its due. 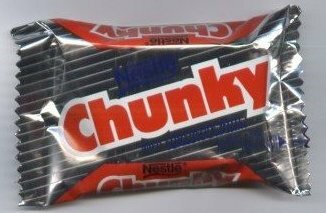 It’s with this in mind that I tell you, Candy Addicts, that the Nestle Chunky bar is the most underrated candy bar of all time. Let’s start with the basics: a Chunky bar, (which got its cringe-worthy name in the 1930s, after inventor Philip Silvershein decided to name the bar after his granddaughter, who apparently was also called “Chunky” – for obvious reasons), is a slab of creamy Nestle milk chocolate, raisins, and peanuts. It’s a bit like a giant Raisinet/Goober hybrid, as if someone left a box of Goobers and Raisinets to melt atop each other and then re-harden into a trapezoid of awesome.